Vincent makes sure his voice carries far enough for me to understand that I need to push through thirty seconds longer, even with all the background noise. In fact, I am hardly aware of my environment. Or was, until I identified a moving object in the corner of my eye. When I strain my head to look left, I see a toddler watching me with a strange expression on his face. I am focused on the burning sensation in my abdominal area and my mind telling me that I should just give up. But Vincent’s reference to time gives me a new surge of willpower and I manage to uphold my body in plank position, supporting my rigid body on just elbows and toes. When I collapse on the grass as soon as I am allowed, I look up to see if my observer is still there, but his interest in my static exercise was of short duration. Perhaps disappointed that my way of play involves so little laughter or movement. He waddles back to his family members who are assembled around a barbecue and sitting down on a picnic blanket with even younger children. It is not the first time my presence at the park has attracted the attention of a child, as most of our collective suffering creatively involves playground equipment. As the surrounding sounds start to penetrate my ears while I catch my breath, I slowly regain awareness of my environment. 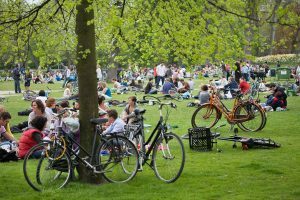 On this Wednesday afternoon, the beautiful summer day has attracted many to Vondelpark, situated at the heart of Amsterdam. It is buzzing with tourists, families, cyclists and even the occasional birthday party, decorating the trees with bunting flags. And then there is us. Fifteen young women in colorful athletic gear, sweating profusely under Vincent’s supervision, who is looking at his phone while we take a drink of water. It is unusually crowded around the playground where we commonly assemble. Vincent had to improvise today, as his territory has been claimed by those for whom the area was designed for. Children are playing in and around the shallow pool that has been filled with water by the park’s maintenance crew, who must have anticipated the warm weather. He directed us to a small piece of grass that was still within the borders of the playground, which meant we would be safe from falling into dog poo when our bodies finally give in to gravity. The well-maintained park is a familiar spot for leisurely runners, cyclists, and the occasional ballgame. The wide, paved road circling the area spans a perfect three kilometers run or walk, with plenty of shortcuts to take you through the inner park’s twisty lanes. Located at the heart of the city, it’s trees, waterways, green fields and spacious car-free lanes are a welcome site amidst the seventeenth century mansions and city traffic. Not unlike other city parks, it provides space for those in need for a physical stretch or for the mind to wander off. 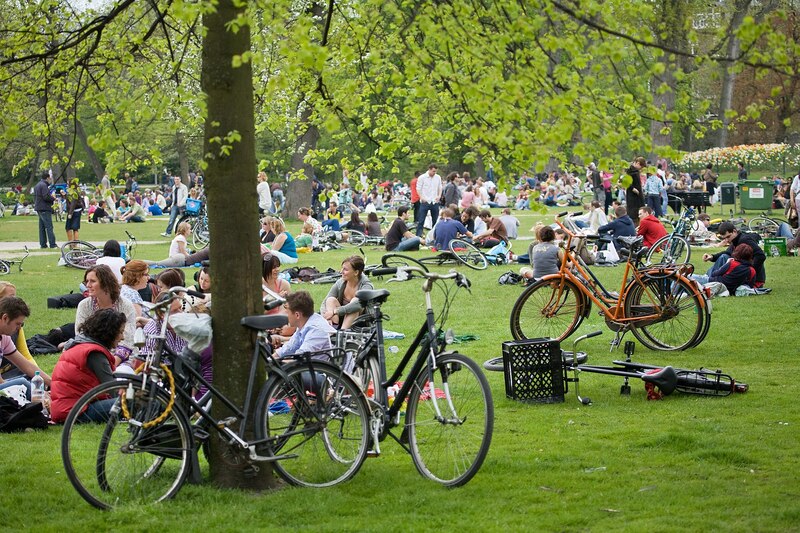 And with many residents lacking a garden or balcony, Vondelpark often serves as an extended living room to host birthday parties or barbecues. The playground is fenced in to keep dogs out and to prevent children from going on solo adventures, granting parents a momentary break from keeping watch. Vincent’s presence, wearing both a dark track suit bearing his company’s logo in bright yellow and a serious expression on his face, has become a familiar sight around this time of day. The large cargo bike carrying workout equipment marks his territory and our meeting point. After nearly eight years of claiming the same spot every day, Vincent and his clients seem to have integrated alongside the trees, municipality workers emptying the trash bins at first light, tiny humans dangling from playground equipment, the colorful parrots that seem to thrive in the environment, and suited up business men and women on their way to or from work. However, our presence is not without controversy. When Vincent and his business partner Tom settled with their company within the park’s fences in 2007, Tom estimates that at that time five others offered similar services. Now, he guesses their fitness concept competes with over fifty providers within the proximity of the park’s borders. The overwhelming presence of fitness in the public park in the summer of 2016 caused the Amsterdam municipality to consider intervening, reasoning that the park is not intended to function as ‘office space’ and that it shouldn’t prevent children from playing in those designated areas. Fitness initiatives in the park are challenging a previously unarticulated separation between spaces of ‘work’ and spaces of ‘leisure’ in the city. For Tom and Vincent, it is exactly the park’s features that drove them to settle there. Its central location increases their visibility, and continues to draw in new clients. As one young woman put it: “I used to come to the park to have a glass of wine with my friends, but the more people I see working out and sweating, the more I think I should do the same. That’s why I joined this bootcamp class.” The increasing number of trainers, often recognized by branded tracksuits and loud voices, and their sweating clientele are rapidly altering the park’s energy. Originally a place to relax, it has become a buzzing, active space. Music, often upbeat and loud, serves as a motivational sensory experience that travels beyond workout territories, blurring the boundaries where fitness ends and barbecues or afternoon drinks begin. Vincent founded his company, offering early morning and after-work bootcamp sessions at the park, with his close friend Tom. The two young men befriended each other as students at their soccer club, and grew even more close after taking up a job at a popular Amsterdam café where they worked late night shifts together. To stay fit during the summer break, they would go to the gym for strength training. Working together at the café had not only made them closer as friends, they also realized how well they functioned as a team. Tom’s open and enthusiastic personality complemented Vincent’s looks, who was doing modelling work on the side. Their network quickly expanded while working at the bar, which was situated in one of the city’s most popular entertainment areas. As they grew older, working late nights began to take a toll on them, which increased their focus on their workout regime in order to stay fit. 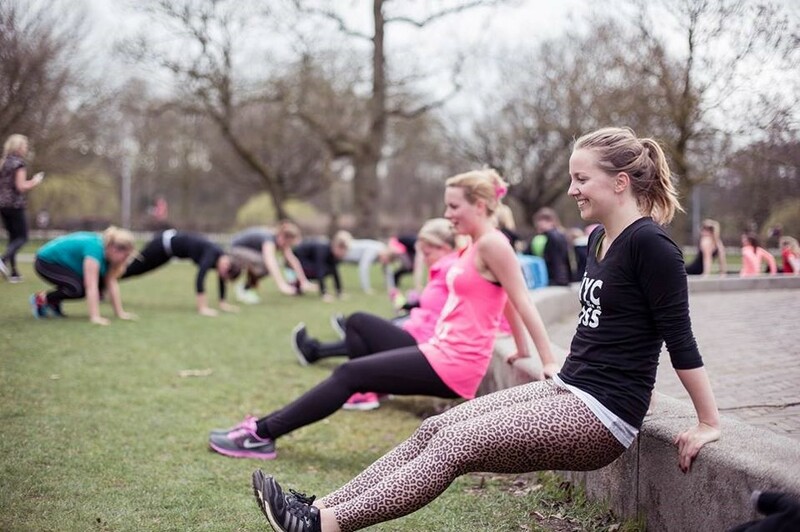 That is when they started noticing small groups of people gathering in Vondelpark, situated in the center of town, who were exercising, weight lifting and running under close supervision of a trainer shouting instructions. Looking for something more sustainable, profitable and healthy, and enjoying their newfound enthusiasm for and interest in fitness and exercising, Vincent explains how the leap from bar tender to personal trainer was not that big: “We walked around the park and saw people doing this, and we thought, ‘hey, we can do this too’. That’s when we signed up for a little course (…) At night we would recruit people for our bootcamp program, like, you can have your beer at night, but then you also need to work out to burn those calories. You know? That’s how we sold it, and it worked.” The network they built by working in Amsterdam’s night life now provided them with a starting capital to build their business in quite a different economy. Vincent and Tom’s journey shows how the economy of health, fitness and wellness is embedded in and growing amidst other aspects of city life, such as Amsterdam’s nightlife economy. Imagining a career in the fitness economy whilst tapping beers shows how such seemingly opposite practices are made to become meaningful in relation to each other. It is not an economy acting in isolation. Whether these relations are tense, supportive, or perhaps stimulating in nature, is up for investigation and dependent on which flow we choose to follow. In engaging with ‘the’ wellness economy, one is likely to forget how practices and people such as Vincent and Tom, are woven into cities and connected to other networks of living, making such an economy matter in daily life. Bridging practices such as drinking with exercising or dieting shows how such endeavors are not existing in opposition to each other, but can work within a similar logic of healthy living. The toddler is engaged in my practice, as I am part of his reality, working out in the fumes of his family’s barbecue. When fitness is being displayed in public places, it becomes a part of city life, and not only for those who do the sweating. This entry was posted in Body Politics, Diet Practices, Politics of Health and tagged fitness, healthism, neoliberalism, urban lifestyle, wellness. Bookmark the permalink.